In view of the limits on the powers of the European Parliament it is often argued that there is a democratic deficit in the EU. On the basis of your knowledge, do you agree, and how can the deficit be removed? Does the draft constitution assist to reduce the democratic deficit? One of the few issues concerning the EU which is generally agreed upon is that the EU suffers a 'democratic deficit'. This 'democratic deficit' relates to the detachment between EU institutions and the citizens of the member states. European Parliamentarians are the first to point this out in efforts to attain greater power over the legislative and executive processes and thus remedying this deficit. Since 1979 the European Parliament has been the only directly elected body. As such it has been proposed that its powers should be increased as it is the institution which is representative of the citizens. As Jean Luc Deharne stated in 2003 '...if the EU suffers from a democratic deficit, there is only one basic thing to do: to increase the power of the elected representatives of the citizens' - these consisting of national Parliaments and European Parliamentarians. The issue of democracy within the European Parliament stems from the beginnings of this institution. The European Parliament had originally very few powers; its functions were merely advisory and supervisory and it was not intended as a legislative body. When the economic and political powers of the Community became more obvious, critics became more concerned with the lack of democratic process and accountability within the European Parliament. ...read more. This has led European Parliament to refuse to give their opinion and thus the bill cannot be made into an act. In these circumstances however, the European Court of Justice states that European Parliament has a duty to cooperate and if there is an urgency to adopt an act and European Parliament refuses to give its opinion, the council can adopt the act without their opinion. As such there is a democratic flaw in laws that are passed using the consultation procedure such as Agricultural issues. 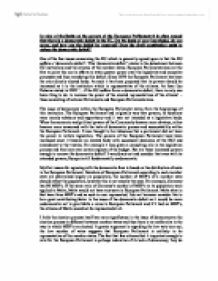 A further argument in agreement with the issue of a 'democratic deficit' relates to the co-decision procedure, introduced by the TEU to increase Parliaments powers. Within the co-decision procedure the bargaining powers of European Parliament have been improved and European Parliament has much more of an active role in the legislative process. If European Parliament agree with a proposal and council also agree by way of a qualified majority, the act is deemed adopted. European Parliament may even make amendments which, if accepted by the council, will be adopted. Even when council rejects European Parliament's amendments or the proposal itself, there is still a possibility that the act will be adopted through the conciliation committee procedure. If the co-decision reaches this stage, both council and European Parliament must accept the act for it to be adopted. It is evident that this procedure improves the democratic credentials of the community; If there is a debate over a proposal, both European Parliament and council must inevitably agree for the act to be adopted. ...read more. British will vote for a British President, A French for French. Another idea included in the draft constitution is the idea of a 'yellow card'. This is given to national parliaments to hold up if they think a piece of legislation would be better handled at national or regional level. This could allow national parliaments to scrutinise EU legislation more closely. It has been suggested that this could have a positive effect on European Parliament as they could tap into the media attention that surrounds national Parliaments but has yet to reach Strasbourg; this media attention could incite citizens to vote, thus creating more democratic legitimacy within the European Parliament. 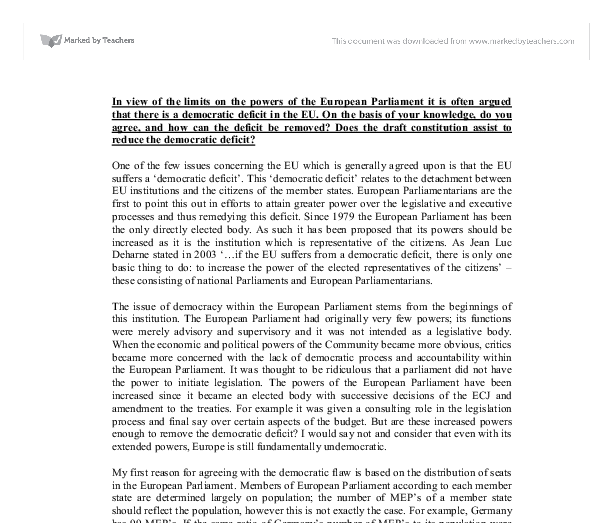 There are some measures that are not introduced by the draft Constitution which I think would have been significant in reducing the 'democratic deficit' within the European Parliament. For example a parliamentary assembly with full powers of scrutiny over EU decision making would give decisions made within the EU a greater democratic legitimacy. A body elected by the people demands respect. The institutional changes required to make European institutions more democratic have scarcely figured in the debates in Brussels and even less so in the draft constitution so that the European Parliament will still fail to command the respect it deserves even after the draft Constitution comes into force. I think that perhaps Europe is too large and diverse to ever attain democratic legitimacy and that there can never be the existence of a European People embodied within the European Parliament. ...read more. Since there are competing interests within the EU, with variable amounts of power, decisional outcomes inevitably derive from compromise. This is undemocratic since it gives power to those with money and the ability to employ efficient lobbying techniques. Secondly, Nugent asserted the political elite model that highlights the concentration of power at official and political levels. The situation improved marginally in 2004, with a UK turnout of 38%. Throughout Europe a steady downward trend in turn out to European elections can be seen since 1979. One way of tackling this problem is to make voting compulsory; this method has been adopted in Belgium and Luxembourg. Nevertheless, this is not to undermine the role of the Commission in the EU policy process. As John Pinder writes 'the Commission has been the architect, and often the initiator, of many of the community's achievements.' It would be a fair argument to say that the Commission has far more influence than the Council of Ministers. The commission is the independent beurocracy of the EU. It proposes draft legislation to the council of ministers and the European Parliament. It also act as the guardian of the EU treaties i.e. it can institute legal proceedings against member states. Although it has the right of initiative, the Commission does not take the main decisions on EU policies and priorities. As a result, there were many people who were forced to work at the new factories being built. This meant they had to move to towns and cities so that they could be close to their new jobs. It also meant that they made less money for working longer hours.